Just looking for some insights into what works in terms of basic bolt-ons for 2006+ F20c equipped S2000's. The stock header and inlet manifold look pretty well designed, is there much to be gained by going aftermarket? I was also curious about drop in cams, I noticed BC offer a drop in for the stock valve train. Many thanks in advance for any info! It's going to be a little different for you guys overseas since you have an AP2 with a F20. I'm assuming parts that work for all model years will be your best bet as I don't know the specifics of your motor. Is it DBW? If you can, and I don't know, if you could get a Flashpro from Hondata, you will be a lot better off than not and having to go full stand alone. Test pipe, CAI, etc. won't help as much as a good tune. Don't expect the same amount of gains per part as the K series engine. It is costs major $ to get extra ponies. I would make my own intake and have an exhaust fabricated. The other parts are not model speciifc really. Seems the F20c has aready met much of its potential N/A, having said that, making 240 on a dynojet seems possible? That's not bad. I hope you get the results you are looking for, but I just don't see you gaining 30 hp from those mods. For $2500 you could almost pick up a used SC kit. that was roughly 38 whp gain over stock and even more in the mid range. the drive by wire cars have access to flashpro to tune the stock ecu so i would start there. 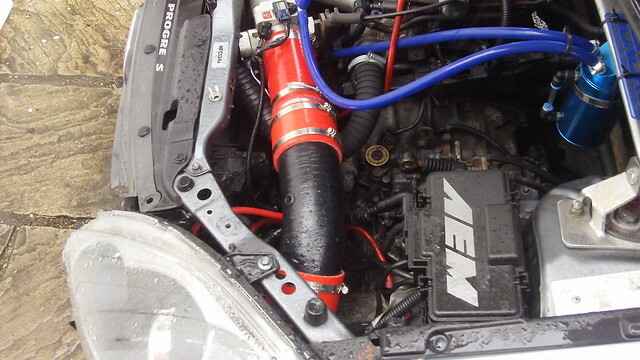 if you want an off the shelf intake, use something with a long pipe such as an aem or injen cold air. 3.5 inch would be more ideal but that would have to be custom made. keep the header stock. add a 3 inch test pipe and a 3 inch single exit exhaust and you're done. that should get you somewhere in the high 220/low 230 whp range on a dynojet. 240 whp is easier to achieve on a F22. don't worry too much about peak hp. you're going to get a nice full powerband with bolt on's and a tune. it's going to be a night and day difference. Find More Posts by b.r.i.a.n. That's not bad. I hope you get the results you are looking for, but I just don't see you gaining 30 hp from those mods.For $2500 you could almost pick up a used SC kit. i've posted my results from my F20C before. here was the thread:https://www.s2ki.com/s2000/topic/909...ed-intake/that was roughly 38 whp gain over stock and even more in the mid range. the drive by wire cars have access to flashpro to tune the stock ecu so i would start there. if you want an off the shelf intake, use something with a long pipe such as an aem or injen cold air. 3.5 inch would be more ideal but that would have to be custom made. keep the header stock. add a 3 inch test pipe and a 3 inch single exit exhaust and you're done. that should get you somewhere in the high 220/low 230 whp range on a dynojet. 240 whp is easier to achieve on a F22. don't worry too much about peak hp. you're going to get a nice full powerband with bolt on's and a tune. it's going to be a night and day difference. Good stuff Brian, do you have a picture of your intake? The dyno gave me all the data I needed to optimise the length. I am thinking the length will be similar on the Sk2 so might not have drop down into the wheel well. I have access to 95ron fuel (UK 99ron) so with the drop in cams 230whp should be easy. i do not have pictures. the intake pipe runs down below the drivers side headlight. it sits behind the fake brake duct on the bumper. i played with length on the dyno too. i had a short ram on there before and the long intake pipe picked up a lot more power up top. i would leave the throttle body and cams for last. add an intake, test pipe, header and tune it.